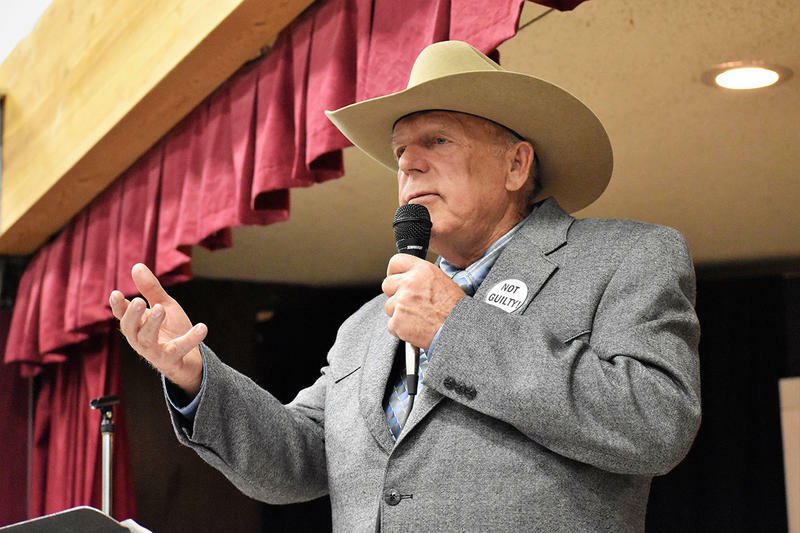 Cliven Bundy drew a large crowd in Paradise, MT January 20, 2018 in one of his first speeches since a conspiracy case against him was declared a mistrial. Many in the audience held video cameras or cell phones aloft to capture one of Cliven Bundy’s first public appearances since his release from jail last month. Bundy gained national attention in 2014 for leading an armed standoff with federal agents in Nevada over his refusal to pay public land grazing fees. A federal judge declared his conspiracy case a mistrial in December, saying prosecutors had withheld evidence from the defense. Along with his cowboy hat, Bundy sported a pin that read “Not Guilty” Saturday night. "So what I would ask you to do today here is act like Montanans," he said in his speech. "Act like you have a county government. Act like you understand the Constitution." More than 200 people came to hear him and other leaders of the current iteration of the Sagebrush Rebellion describe their experiences with what they call federal government overreach. The seven panelists spoke for nearly five hours at the event, organized by the Sanders County-based Coalition of Western Property Owners, or COWPO. 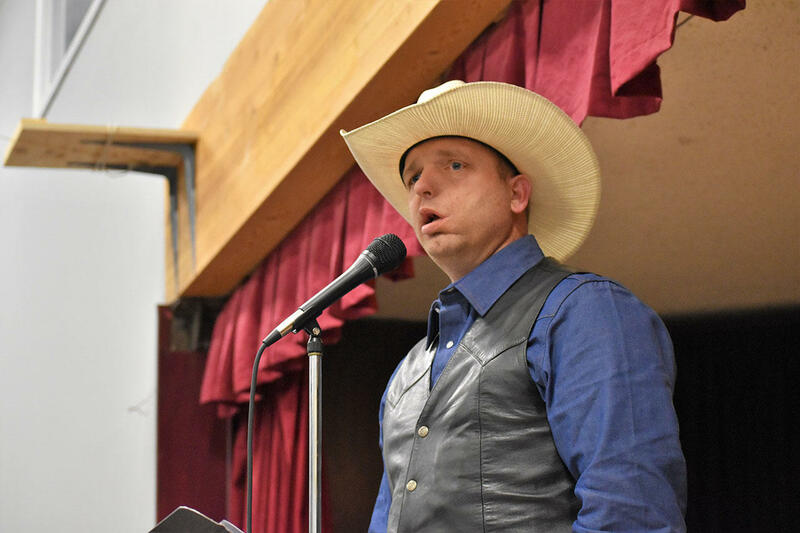 Ryan Bundy speaking in Paradise, MT, January 20, 2018. While Cliven was the main draw, his son Ryan proved the true orator, preaching the supremacy of the Constitution, and how he says the country’s bedrock document is currently misinterpreted. "Governments do not give us our rights, our rights come from god and they exist prior to the existence any government," Ryan Bundy said. "Those who control the land and the resources control the wealth," he continued, "and if they control that wealth, then they can control everything else. And I believe that god intended that to be in the hands of the individuals, and not the government ... Many want to call us anti-government. that is not true. We are very in favor of a government that operates properly. 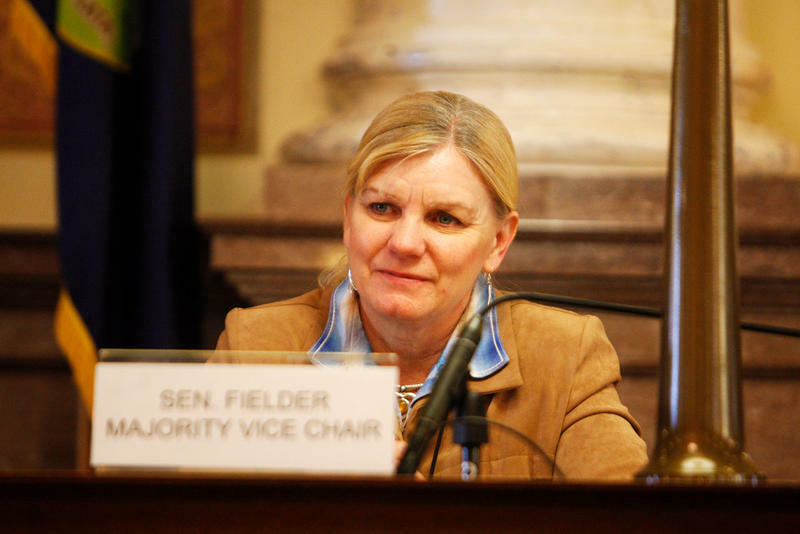 Jennifer Fielder, a Republican state senator from Thompson Falls and CEO of the American Lands Council, also spoke on the panel. 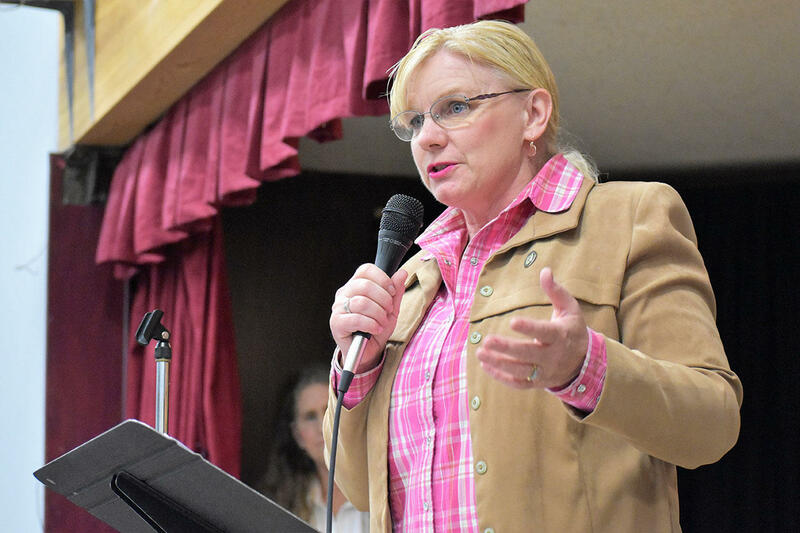 Montana State Senator Jennifer Fielder speaking during the Cliven Bundy event in Paradise, MT, January 20, 2018. "Just a word of advice: never trust a politician," she said, drawing laughter. 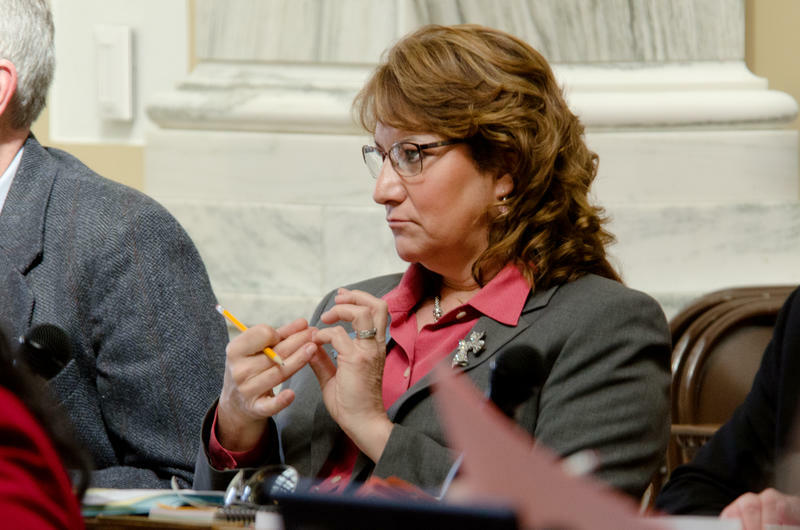 "But," she added, "I don't consider myself a politician, but an elected representative of the people of Sanders County and Mineral County, and part of Flathead County and part of Missoula County. I’m one of you." Standing ovations punctuated the speeches and audience members stormed the stage during breaks for autographs and pictures with the panelists. But when the panel opened the floor to questions, the atmosphere in the room shifted. "Personally I have to say that I'm thrilled we live in a country that is not like the one espoused by Ryan Bundy," said Ryan Busse, the national board chair of Backcountry Hunters and Anglers. A dozen-and-a-half members attended the event in opposition, including Jeff Lukas, who asked Senator Fielder why she continues to pursue legislation that would give Montana control and ownership of federal public lands within state borders. Fielder said she was representing her district. "How many of you that are from Sanders and Mineral County agree with what I just said about the state controlling the land?" Fielder asked, to a smattering of applause. "That's not many," said Lukas. "How about in the room? Fielder then asked. "How many of you agree that the state should control all the public land?" Loud applause and cheering followed. 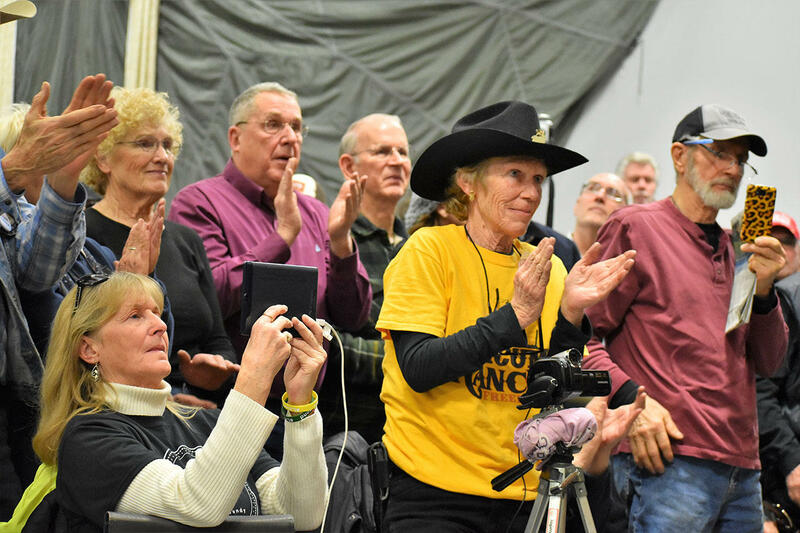 An enthusiastic crowd turned out for the Cliven Bundy event in Paradise, MT January 20, 2018. If others opposed the evening’s discourse, they did so quietly. Theresa Manzella, a Republican representative from Hamilton, cheered Fielder as a spectator. Event organizers said they invited Sanders County Sheriff Tom Rummel, but he didn’t show. In closing, event organizers Roxsanna and Dan Ryan from Plains gave an update about their son, Jake, who participated in another Bundy-led clash with federal agents at the Malheur National Wildlife Refuge in Oregon two years ago. Jake Ryan was later convicted of destroying government property during the Malheur occupation and is currently awaiting sentencing. A Ravalli County state representative says she will bring a controversial property rights attorney to present a land use policy workshop whether or not local elected officials chose to participate. "Absolutely. I’m moving forward," says Theresa Manzella. Manzella wanted to commission Karen Budd-Falen to make a four-hour land use presentation to the Ravalli County Commission. Organizers bringing Wyoming-based property rights attorney Karen Budd-Falen to Hamilton this weekend say tickets are going fast. Budd-Falen's critics, meanwhile, say they'll attend the weekend workshop to make it clear that public lands should stay in public hands. 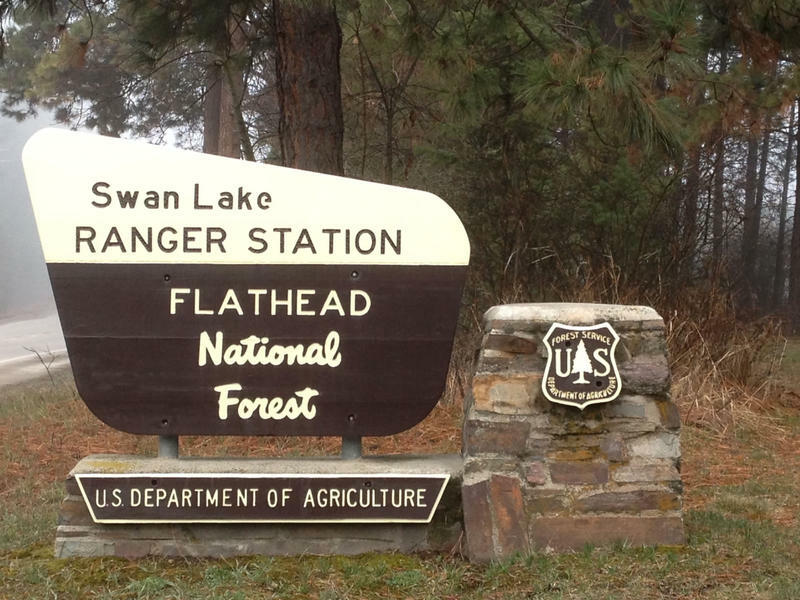 On Wednesday night, 75 people crowded into the Swan Lake Club House to hear a first of its kind in Montana proposal that would transfer management of some National Forest land to the state.